Image Size: 13.25 X 16.5 in. 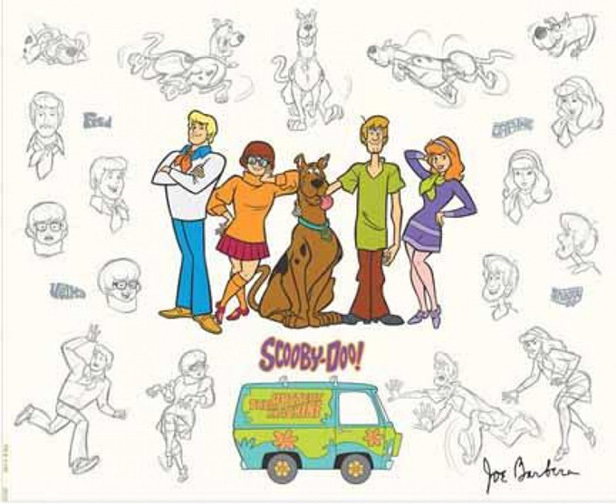 The “Mystery Gang Model Sheet” was inspired by the hit TV series, “Scooby-Doo Where Are You.” The show was developed by Hanna-Barbera, and the characters designed by Iwao Takamoto. Scooby-Doo first aired on television in 1969, and still plays regularly today, making it one of the longest running animated programs in TV history. A model sheet is a group of character drawings illustrating different poses and expressions of a cartoon character. Because a number of artists work on a single cartoon, these sheets are circulated to the animators to give a uniform look and feel to a character throughout a production. Each piece in the edition is signed by Joe Barbera.